Our 9-member Cigar Rating Panel smokes over 200 cigars a week, rating each for proper construction, appearance, aroma, smoke volume and flavor profile. 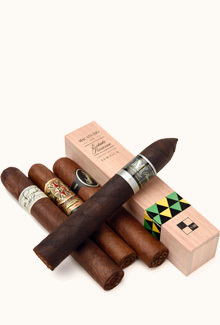 We smoke a lot of bitter, harsh, improperly aged and poorly constructed cigars so you don’t have to! Less than 5% of those considered ever make it to you. Discover this month’s highly-rated cigar selections for each of our 2 Distinct Cigar Clubs using the chart below. Or, view all of our Past Selections. Please Note: Although we will make every attempt to ship the products listed, occasionally we may need to substitute them with equally outstanding cigars. If you strongly desire to receive those listed, please contact us at 800-625-8238 so that we may note your account accordingly.